How to represent activities is a key decision when producing Time Chainage charts. 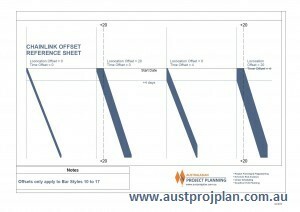 Some activities suit being presented as lines progressing across the works, others are suited to being blocks indicating occupancy of an area. Chainlink offers several different shapes, and then allows various fill patterns that, when combined with colour patterns, can represent many differing types of activities. Attached to this posting is a shape reference sheet that presents these shapes and their respective fill patterns – useful to have handy when deciding how to represent activities. When using Bar styles 10 to 17 in Chainlink, offsets for location and time can be specified for each activity. These may be useful if wanting to representing a fixed duration or area of occupancy as an activity progresses along from its start to finish points. 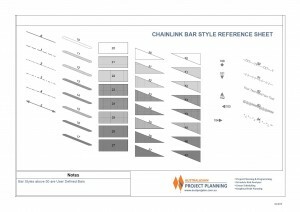 The attached reference sheet provides a visual guide to how using these offsets can alter a bar shape.